Penneagle II provides an excellent playing surface for tees, fairways, bowling greens, or croquet courts. It has medium-fine, non-aggressive, semi-erect growth habit with a darker green coloration than most other bentgrasses.The early spring green-up helps compete against grassy weeds such as Poo annua. Recommended seeding rate is 1.5 Ibs/1,000 sq ft for new plantings and O.I to 0.25 Ibs/1,000 sq ft for interseeding. Penneagle II can also be used for winter overseeding in the sunbelt. The amount of the fertilizer should be . 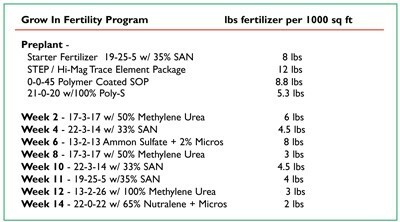 I Ibs of nitrogen every 14 days +/-, depending on approximate growth, clippings, and performance. The yearly amount of nitrogen will be from 2 to 4 Ibs, phosphorous 2 to 3 Ibs, and potassium 6 to 10 Ibs. As far as micronutrient amounts, this should be checked with tissue tests during the year and again with a soil test in the early spring. The first mowing should be done when there is uniform turf coverage with a height from 1/4 to 3/8 inches and definitely not more than a 1/2 inch. The mower should have a smooth front roller. It has been reported that some people have used grooved rollers too early. Clippings should not be caught early on, as this will help build a biomass or padding that will protect the plant from damage. During the early stage it is important to do a weekly light topdressing.This will cover the clippings and smooth any roughness in the surface as well as accelerate the filling-in of the turf grass canopy. It is possible to get to the desired mowing height within six to seven weeks after the first mowing, if not sooner.The Penn series grasses are maintained by most facilities at 1/8 inch or lower for greens. 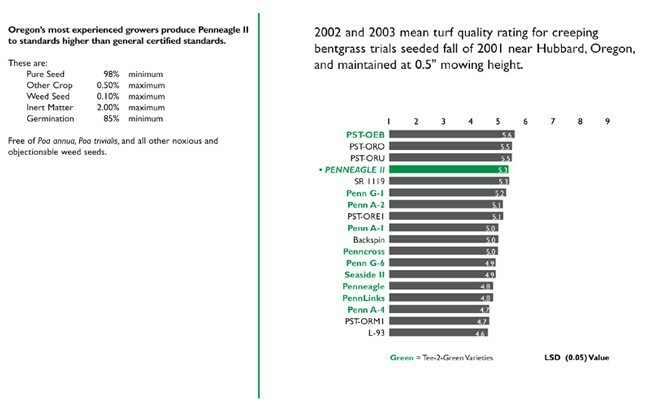 The most experienced growers produce Penneagle II to standards higher than general certified standards.